Beverly passed away in her home on January 12th. She was only 56 years old. Beverly was born on August 4, 1962 in Montgomery, Alabama, the youngest of 5 children in a military family. As such, she traveled throughout Europe as a child and lived at various bases in the states including New Mexico, California, Colorado and finally settling in Oregon in 1977. 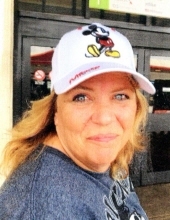 Beverly kept her love of traveling but being with her family and friends made her happiest. She loved her job at Pape Capital Equipment and the people she worked with. Beverly thought of them not as co-workers but as family. She was a hard worker and enjoyed traveling the roads around western Oregon. Beverly faced life with a joy that was contagious to all around her. Her beautiful soul shined through her eyes and drew you to her. Beverly passed away 4 years after her mother, Mary Jean Bell, who passed on January 14, 2015 and is without doubt with her heavenly father. Beverly was preceded by her mother and oldest brother, Edwin Jr. who passed away January 1, 2018. Beverly is survived by her daughter Nichole, her father Edwin Bell Sr., her sister Patty and two brothers, Daniel and Robert Bell. Beverly had 3 step daughters, Kayla and Elizabeth White, and Brooke Wren and 1 step son Tyler White and 8 grandkids. The family is grateful for the condolences and prayers from so many friends and family. The family requests, in lieu of flowers, a donation in Beverly’s name be made to the American Cancer Foundation. A memorial service will be held on Saturday, January 19th at 1:00 pm at Dayton Baptist Church, 300 Flower Lane, Dayton, OR. To send flowers or a remembrance gift to the family of Beverly Mary White, please visit our Tribute Store. "Email Address" would like to share the life celebration of Beverly Mary White. Click on the "link" to go to share a favorite memory or leave a condolence message for the family.